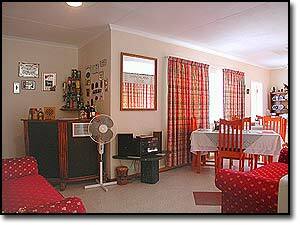 Shingalana Guest Lodge, has a relaxing atmosphere, full of books, music, good wine and food. We cater for both smokers and non-smokers. Shingalana is Lodge is centrally situated in Gauteng, being only 20 minutes from JHB CBD, 5 minutes from Sandton City and 1 km from the Brightwater Commons. The lodge offers accommodation in apeaceful area north of Johannesburg, which offers superior comfort and service. Shingana Guest Lodge consists of six large bedrooms upstairs - all en-suite. Rooming arrangements may be double, triple, twin or single. TV, hairdryer, clock-radio, heater and a ceiling fan. A VCR is available on request. For the business-person e-mail, fax, cell phone hire and secretarial facilities are available. * Transport to and from JHB International Airport and other major centres by arrangement.